I actually had no idea what I wanted to eat for dinner tonight, but I surfed on over Tasty Kitchen and decided to peruse the sandwiches. Man, did I hit the jackpot!! I’m a huge sucker for Chicken Parmesan, but the prep is hardly easy and the cleanup, at least for me, takes longer than the cooking. Plus, you can’t ever make just one serving. Luckily, I found I could have the taste of Chicken Parmesan that I love without the frying and the pie tins of egg, flour, and breading strewn across my counter. YAY! This recipe is simple, hearty, and cheesy and would pair perfectly with a light green salad. Buon Appetito! Chop cooked chicken breasts into small 1/2-inch pieces. Heat spaghetti sauce in saucepan and add red pepper, italian seasonings and chicken pieces. Cook until chicken is heated through. Slice hoagie buns in half. Mix softened butter and and garlic until well incorporated. Spread garlic butter over bread. Preheat broiler. Place bread on a pan, butter side up, under broiler. Broil until golden and crunchy. Distribute the chicken mixture over bread. Top generously with cheeses. Return to oven and broil until cheese is melted and bubbly, about 3 minutes. Remove from oven and let set a few minutes. Note: You can prepare the chicken breasts however you like – baked, sauteed, rotisserie, etc. Leftover is perfect! Nothing says spring like a pollen covered car. It’s the sign that spring has sprung, that new life is blossoming, and that light, yet flavorful meals are a comforting dinner. My new standby pasta dish? Thanks to Pioneer Woman? Fits the bill perfectly. I mean, seriously, what says spring like lemon? And when you combine that with a bit of garlic and toss with some pasta? It’s not going to disappoint. Well, this dish serves as that comfort for me. Only my day wasn’t stressful and my ingredients are sour cream, lemon, garlic, and butter. Nevertheless, after you’ve whipped it together once it’s practically mindless to whip up again. And mindless recipes that always come out right? Never hurt anyone. Preheat oven to 375 degrees. Cook spaghetti until al dente. In a skillet, melt butter with olive oil over LOW HEAT. When butter is melted, add minced garlic. Turn off heat. Squeeze lemon juice into the pan. Combine mixture with drained spaghetti. 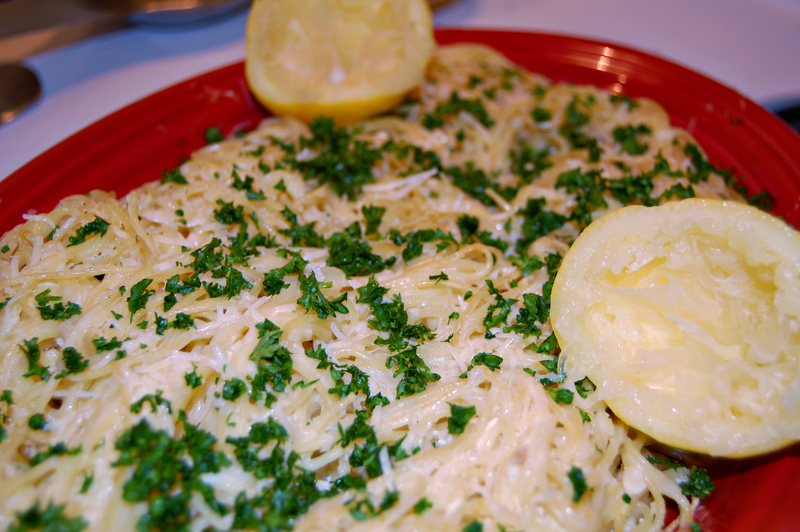 Transfer spaghetti to an oven safe dish. Bake, covered with foil, for 15 minutes. Squeeze a little more lemon juice over the top after you remove it from the oven. Top with Parmesan cheese and chopped parsley. Enjoy! Here’s the thing. I’m not a big whole wheat person. [Almost] Every bread I’ve ever tried that’s wheat has been either too “oat-y”, too “grainy” or tasted too much like chalk. So when I saw the ingredients for banana pancakes, a la HG‘s 200 Under 200 book, I was hesitant. Also, I’ve been afraid to try soy milk. Lucky me, this recipe calls for both. As soon as the cinnamon-y dry ingredients combined with the banana-y wet ingredients I knew this would be a winner. Boy was it ever, if I hadn’t made them myself I wouldn’t even have known they were low-cal and healthy. The texture was perfect, no grainy or chalk taste here, only fluffy pancake goodness. As for my topping, I didn’t leave them plain as you see in the picture above, nor did I drown them as syrup (because? as much as I wanted to do that I wanted to NOT go to the grocery store more). Instead, I sprinkled them with Splenda, it added the extra sweetness the syrup would’ve provided, without all those calories. Adam and I took a short road trip to St. Louis to visit my sister and see the sights just over a year ago. In the days leading up to it I was obsessive about a restaurant I had found online, as well as a museum my sister had told me about. In fact, obsessive may be a bit of an understatement. The entire trip ended up becoming quite the palette pleaser, except for Adam’s idea to eat at White Castle for lunch on our drive up. From wine and nuts, to soul food OMG-ness and custard, this post is best read not on an empty stomach. The restaurant was “Sweetie Pie’s at the Mangrove” and the owner was a former backup singer for Ike and Tina Turner [So umm, yeah. Cool!!!]. Food Network had featured it on “Diners, Drive Ins, and Dives” so I had high expectations. It was fantastic. Served cafeteria style, you had your choice from 5 entrees coupled with 2 sides of your choice, cornbread, and an optional dessert. 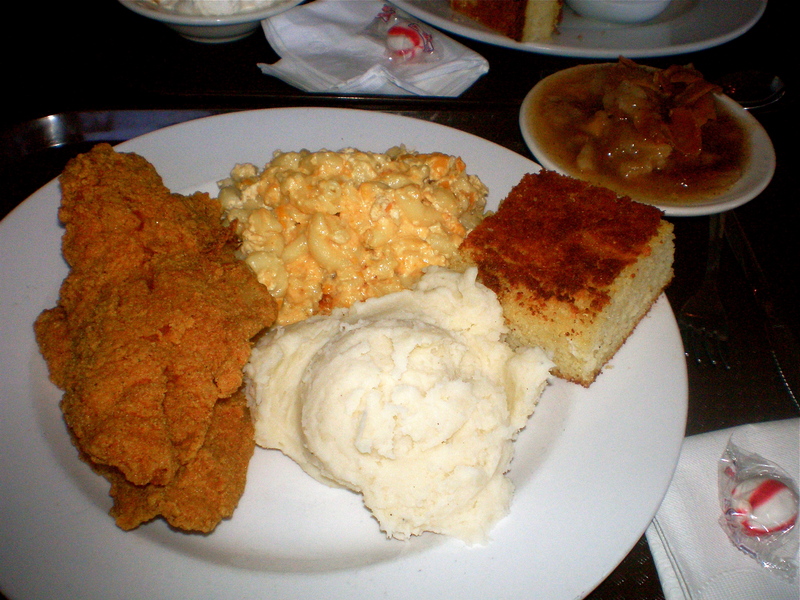 Here you see (clockwise) the crispiest and flakiest catfish I have ever put my lips to, the cheesiest 4 cheese mac and cheese cooked to perfection, a big hunk of moist cornbread, and the buttery deliciousness of mashed potatoes. For dessert I had an amazing peach and apple cobbler and a nibble of Adam’s INSANE banana pudding. I think I said OMG around 100 times while consuming this. The portions were HUGE, so huge in fact I had to take about half of what you see to my sister. Words cannot describe how great this meal was. I think this was the first time in my life that I was too full to clean my plate, and that was the biggest disappointment of this meal. A blog I follow almost daily is Design*Sponge. Last week they featured these cupcakes and I fell in love with them immediately. Long story short, tonight I finally had time to bake them, and boy were they worth the wait! The cake is moist and fluffy, the frosting has just the right balance of orange flavor, and the smell, oh the smell! My apartment smells phenomenal! 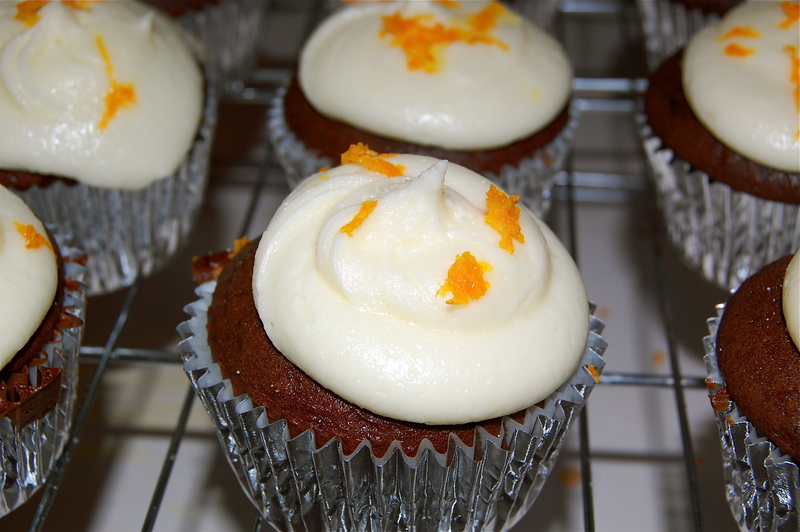 Who knew adding/subbing a simple ingredient could make a seemingly perfect cupcake something unexpected and fabulous? Best of all, you won’t believe how simple these were to make! Follow box directions, replacing and adding the ingredients listed above. I’m blaming the fluffiness of the cake on the orange juice, I’ve never had cupcakes turn out like this! Use a round piping tip to pipe the icing. Zest an additional orange for to garnish and sprinkle a little sugar on top. Tonight, I had a craving for pizza. I’ve always been a fan of margherita pizza, but whenever I order it something’s always off. There’s either too much tomato, too much cheese, not enough basil, etc. etc. I’ve never made a true pizza at home before, but thought it couldn’t be that bad, right? After my daily workout, I headed to K-Roger, as Adam calls it, and picked up the ingredients I thought I’d need. I laid everything out on the counter and started playing. Well, my playing paid off, because my pizza was fantastic. In fact, it’s taking everything I have not to eat the entire pie in one setting. Roll out the pizza dough onto your baking sheet/stone. In a small bowl, season EVOO with garlic powder and seasonings to your preference. Brush oil mixture onto the dough. Tear apart the mozzarella slices and spread them out across the dough. Thinly slice the tomato and place slices on top of the cheese. 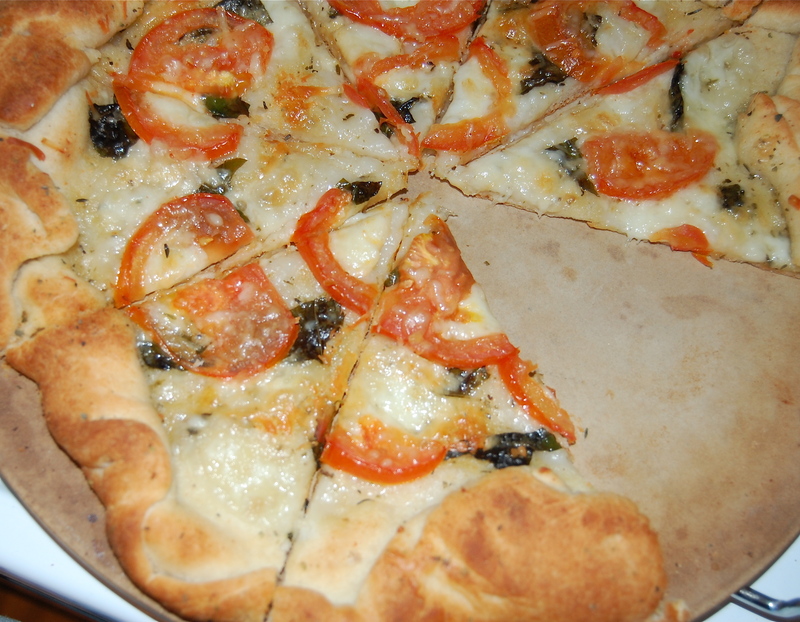 Once out of the oven, tear basil leaves and sprinkle on top. The Fins have it right. Their meals are thought out and healthy. Colorful and, I dare to say, completely natural. We were lucky to get traditional “home cooking” for the majority of our stay and while I’ll be the first to say I’m a picky eater (I’m sure I’ll get a lot of agreements on that statement), I managed to find at least one dish at each meal that I enjoyed the taste of. I always loved the appearance of every dish! 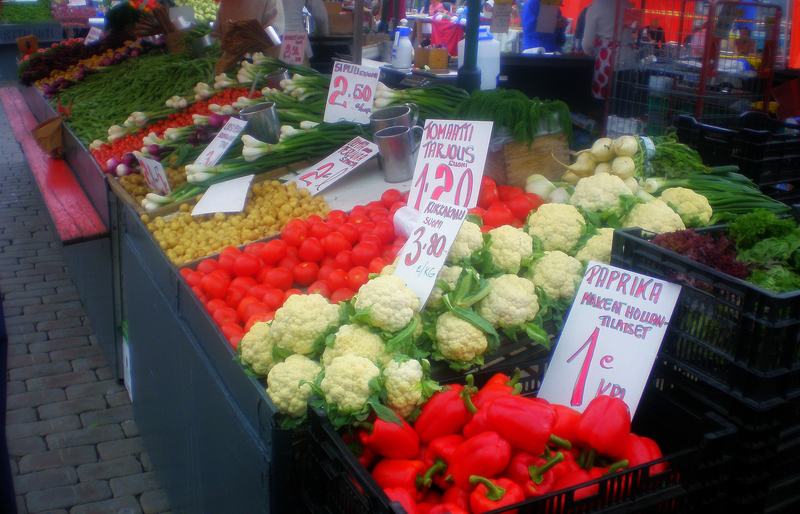 I remember the first morning we were there and seeing our host, Liisa, come in from the grocery store with a big, woven basket of fresh fruits and vegetables. The thing that I was most surprised by was the way lettuce was sold. The roots were still attached at the bottom and the top was open to the air. Liisa told us that she could re-plant the lettuce if she wanted, but she rarely did. Every meal had a beautiful, fresh salad. Easily the most colorful and vibrant I’ve ever seen. Crisp green lettuce and bright red tomatoes were the standard in almost every salad served. Additions like red onion, watermelon, cucumber, oil soaked feta, and grapes would also accompany the salad. One thing I’m sure to try back in the states is adding watermelon and red grapes to my salads every once in a while. Potatoes were another big staple of Finnish cooking. Usually served au gratin or boiled with fresh dill, we learned that the Fins really enjoy a good starchy potato. Every meal had some sort of meat. While there we had chicken, beef, and pork. My favorite preparation were the mincemeat patties with onion. Similar to meatloaf, but fixed without ketchup and in small patties, they were cooked in the oven and positively delightful!! One obvious and yet ignored practice by most Americans is that if the Fins have a heavy meal for lunch or dinner, the other meals of the day are adjusted accordingly. Normally the smaller meal is a simple preparation of breads, fruits, and cheeses. I’m really going to have to adopt that. These small meals were some of my favorites of the trip. This weekend, I lost some of my closest friends. The kind of friends that you can depend on to help you through the worst of times, bringing you joy simply by being in their presence. This weekend? These friends plummeted to a horrifying death that ended on my kitchen floor. These friends cooked with me, like trusty sous chefs. They were dependable, helpful, and perfect. These friends? Were my measuring spoons, and not just any measuring spoons. Spoons I had searched at least a year for and found at the one and only Anthropologie. 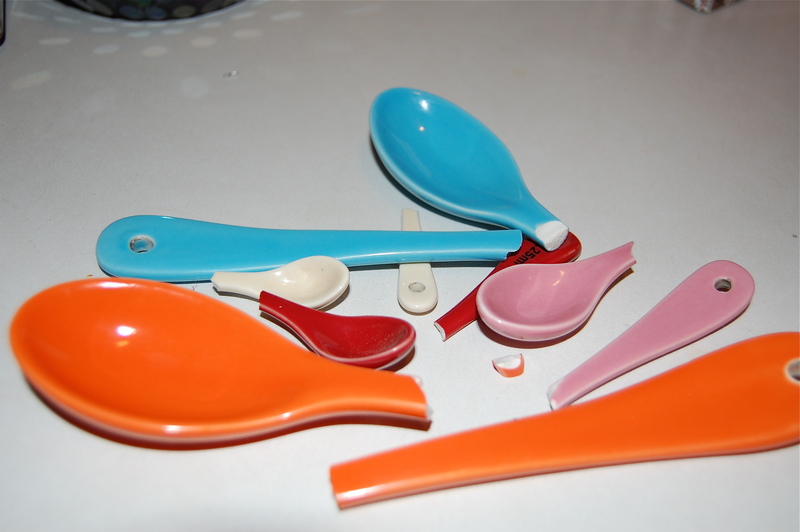 These spoons were me. They were my soul in spoon form. Delicate, colorful, cheery, and positive. They were all that and more. One even measured a “pinch”. I mean? Come. On. How precious is that? But now? Now they have a new life. A life broken, lying on my kitchen counter, because I can’t bear to part with them just yet, and a life of unspoken dreams, helping me make Boeuf Bourguignon and Coq au Vin. Last week I had a hankering to cook up some comfort food. I wanted something easy, that used ingredients I already had in my pantry, and was quick. I dig through my cabinets and see some whole wheat/whole grain bread, sugar and cinnamon. I immediately become reminded of my childhood and having breakfasts of Cinnamon Toast. The memories flood my mind as soon as the aroma fills my apartment and I’m in a nostalgic heaven. Memories of flouring the kitchen while “baking” before mom wakes up, helping my grandmas bake on the weekends, and more recently finding my love of cooking – one recipe at a time – bring a smile to my face. 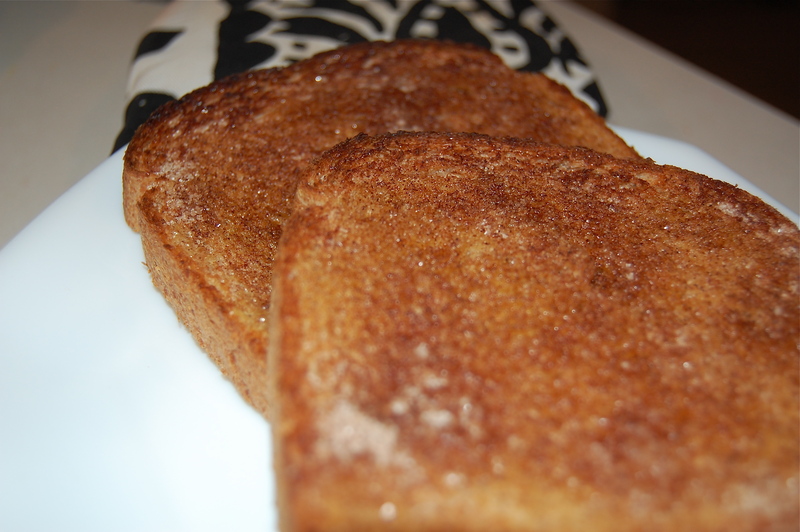 This cinnamon toast is the epitome of comfort food to me and has quickly become my breakfast staple. Mix cinnamon and sugar together, then sprinkle onto the bread. Place in oven and cook until toasted. Be careful not to burn. I don’t know what it is about fairs, but their sketchy amusements excite me. 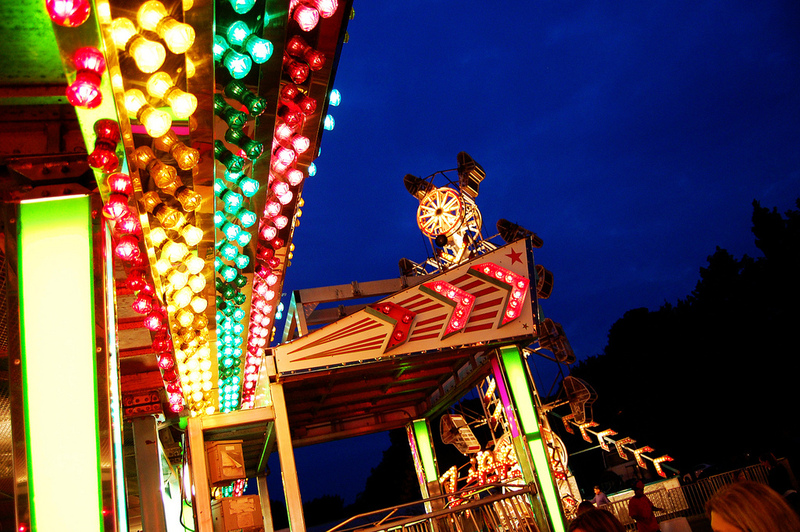 Last fall, I had the opportunity to accompany a friend and her daughter to our local fair. I was very excited about going, 1) Tilt-A-Whirl! and 2) Funnel Cake, but little did I know what I was getting myself into. The Tilt-A-Whirl that I was able to ride 5+ times in a row as a kid? I barely made it through one ride as an adult. The funnel cake I could practically taste on my lips just by smelling it? I ate maybe half of it before it got to be too sweet for me. The things I enjoyed, that I didn’t think I would? Carnival games, I was the Skee Ball champion of our little group. I also developed a new found appreciation for my parents [all parents, really] who take their children to the fair year after year. Who knew you could blow 40 bucks in the blink of an eye on ride tickets, only use up said tickets in 10 minutes on 4 rides. Seriously, those amusement companies have to be making some serious bank. 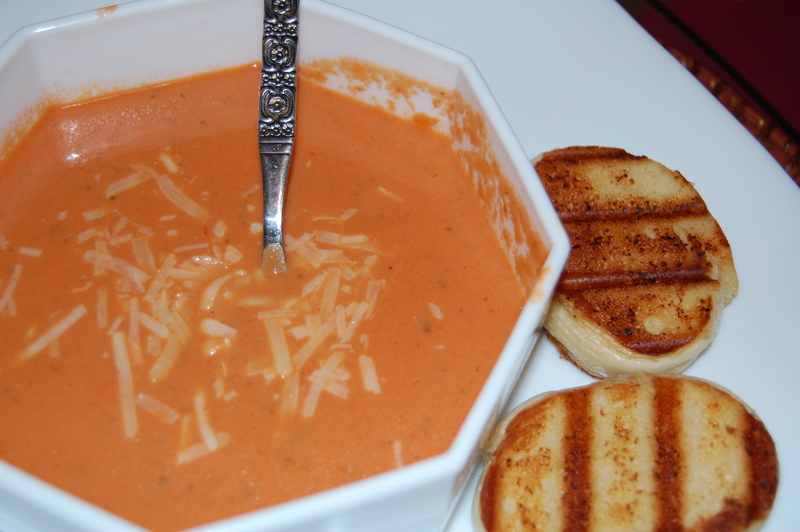 I found a tomato basil soup recipe that I like, FINALLY. I’ve been through 4 recipes and so far? I was hanging by a thread, and I needed this recipe to be good. If for no other reason than I’ve been craving a good at-home version for weeks. Place tomatoes and juice in a stock pot over medium heat. Puree the tomato mixture along with the basil leaves. Return the puree to the stock pot. Place the pot over medium heat and stir in the heavy cream and butter. Heat, stirring until the butter is melted. Do not boil. It’s Friday! I’ve got the weekend to myself and I’m ready to chill until Monday. I’m starting my weekend off with a bit of comfort food. 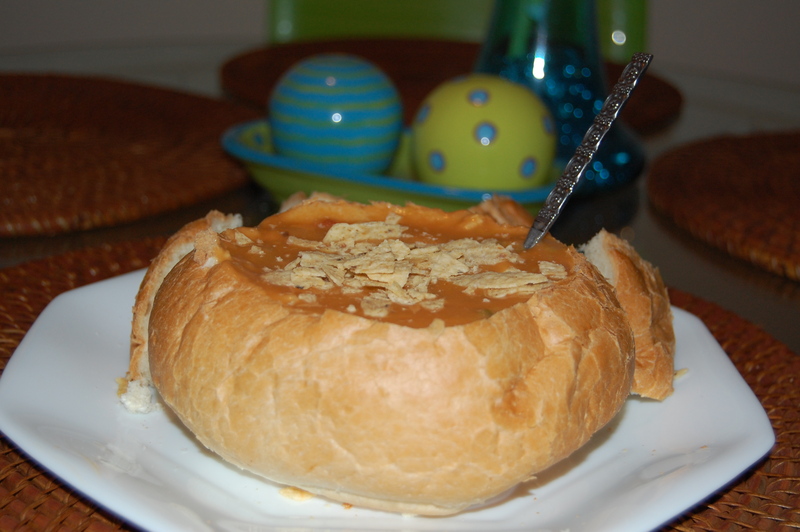 I don’t think there’s anything more comforting than a crusty golden bread bowl of tortilla soup. 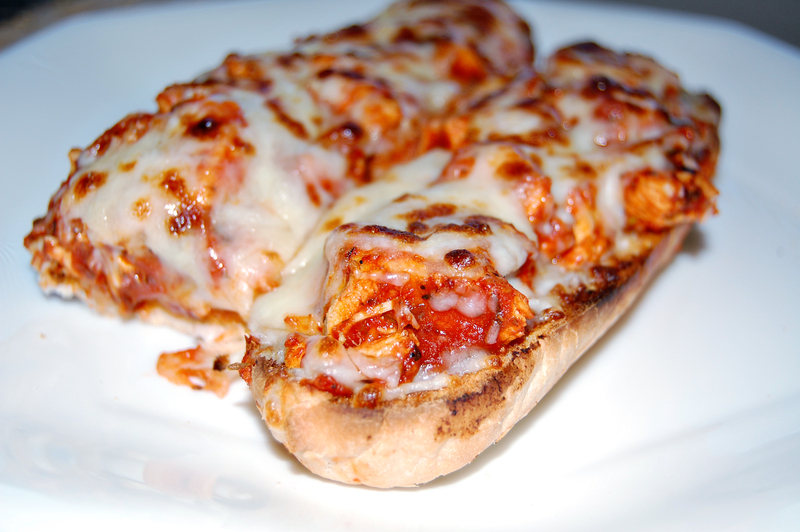 It’s spicy, hot, and a bit cheesy; just what I needed before I start my Friday DVR catch-up!